It took a while, but Olivia Barnes found an Airbnb that looked like it could belong in 1947. Inside the little house, cast and crew expertly weave between backpacks, props and antique furniture. Extra lighting equipment is stuffed into the front hall and costumes hang on the curtain rod above the tub. Barnes is one of many senior cinematic arts students filming her thesis projects. Students oversee their own short film from conception to directing to post-production in a two-year process. Last year, professional screenwriter Dan Gordon chose Barnes’ script for the Zaki Gordon Award for Excellence in Screenwriting. This year, Barnes has the challenge of making her final product live up to the excitement of her script. 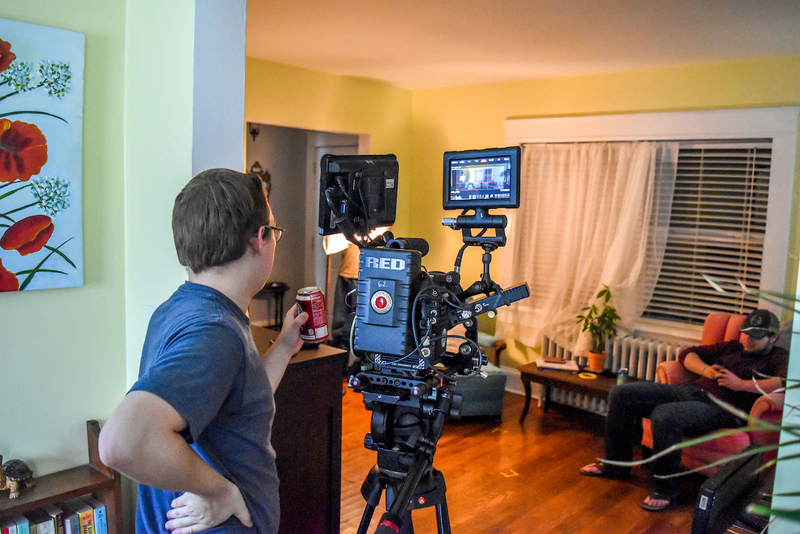 The many short film sets provide a chance for students in cinematic arts and other majors a chance to practice their skills. Abby Hunt is an acting major playing a character named Nina. “One thing that has been huge, from working on film sets, has been connections, and just getting to know people and making friends with people you might be working with in the future,” Hunt said. Barnes’ film is titled “A Dress for Lydia” and is about Barnes’ great-grandmother, who Barnes believes was the first woman in her family to graduate high school. Barnes is using some of her grandmother and great-grandmother’s belongings as costumes and set pieces. “I remember my grandmother as someone who was just very persistent and spunky, and it was so fun to write that out,” Barnes said. On set, a “floppy flag” — a large piece of black cloth — has been secured outside the window of one of the Airbnb bedrooms. With any sunlight blocked out, the team can film a night scene without having to come to the house after dark. The cast, along with the large camera tripod and boom mic, squeeze into the small room. Just down the hall, Barnes has a monitor set up showing the camera’s perspective. 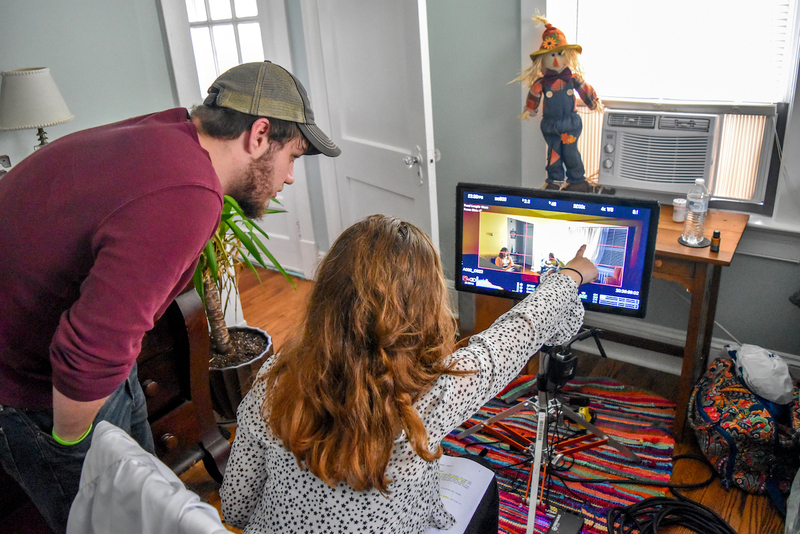 Her producer and first assistant director, Peyton Dixon, announces “Action!” and everyone outside of the camera’s frame freezes until the take is over. Peyton Dixon is a fellow cinematic arts major. His own short film, about a social worker learning to work with trafficking victims, is being filmed this semester. “A lot of filming is problem-solving your own problems,” Dixon said. The team has worked hard. On Sunday Oct. 7 the crew worked for 12 hours to film six scenes, which Barnes said is a typical filming day. For the evening of Oct. 9 they have only the one night scene to film and the atmosphere before filming is lighthearted: Barnes discovers that it is Leif Erickson Day, and the crew immediately hangs up a cheery handmade sign and dons plastic Viking helmets (or as close to Viking as they can find). Then they get down to business and the mood becomes more heartfelt. They are telling a story close to Barnes’ heart after her great-grandmother’s passing in 2016.